IDJ: People in Hong Kong expect electricity to always be ‘there’ when they switch on their lights and appliances, but give little thought as to where it comes from or how and where it is produced. There are two power station sites located in the New Territories near Tuen Mun operated by the CLP Power company, namely the combined Castle Peak ‘A’ and ‘B’ Power Stations and Black Point Power Station. There are virtually no sites in Hong Kong that are readily useable for power stations and it has been necessary to excavate and reclaim to form suitable flat areas from rugged coastal terrain. The choice of Tap Shek Kok for the Castle Peak Power Station was no exception. This site was an area of land and sea bed, granted by Government in 1978. After access was allowed in June 1978, extensive reclamation and site formation was carried out to form the 62-hectare site, with ‘A’ Station occupying 30 hectares and ‘B’ Station 32 hectares. Site formation involved reclamation of the southern area of the site by some 7.2 million cubic metres of granite excavated from the northern area. 1.5 million cubic metres of marine mud had to be dredged to ensure that the seawall rested on a secure foundation. The site utilization of this 4,000 MW plus power station complex is extremely high. Striking comparisons may be drawn with power stations of similar capacity elsewhere in the world where site areas of up to 1,000 hectares have been used. 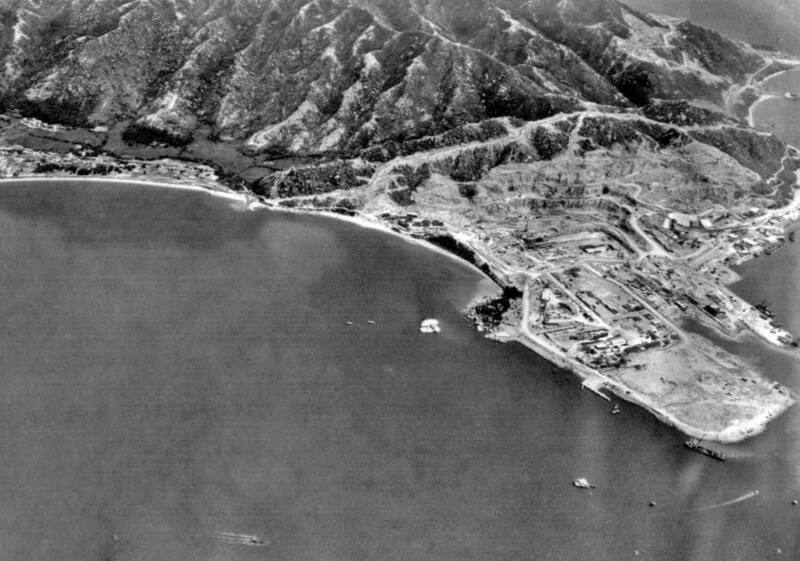 The site has access to abundant sea water for cooling purposes and a deep bay for the berthing of large bulk carriers. The Castle Peak ‘A’ and ‘B’ Power Station has a capacity of over 4,000 MW (Mega-Watts) and at the time it was completed in the early 1990s was the largest power station complex in South East Asia. Unlike the generating units at China Light’s earlier Hok Un and Tsing Yi Power Stations which were entirely oil-fired, coal is the primary fuel for the generating units at Castle Peak. This significantly reduced the companies’ dependence on highly variable heavy fuel oil costs and brought about lower bills for consumers. However, the ability to fire on oil was retained in both the ‘A’ and ‘B’ Power Stations to ensure the security of electricity supplies. Two boilers were converted in the early 1990s to also burn natural gas. Throughout the 1980s economic growth in Hong Kong was phenomenal. Mirroring this was the no less phenomenal increase in the demand for electricity. The number of consumers of electricity in Kowloon and the New Territories grew from 41,000 in 1950 to 154,000 in 1960, and from 531,000 in 1970 to over 1,000,000 in 1982. To cope with forecast demand in the 1980’s, decisions were made in 1977 and 1981 to build Castle Peak ‘A’ Station and Castle Peak ‘B’ Station. These power stations were built and owned respectively by the Kowloon Electricity Supply Company Limited (KESCO) and the Castle Peak Power Company Limited (CAPCO) but staffed and operated by China Light & Power Co.
‘A’ Station contains four 350 MW dual coal/oil-fired units and the ‘B’ Station four 667 MW dual/coal-fired generating units. Together with the four 60 MW gas turbines, the capacity of the stations is 4,280 MW. 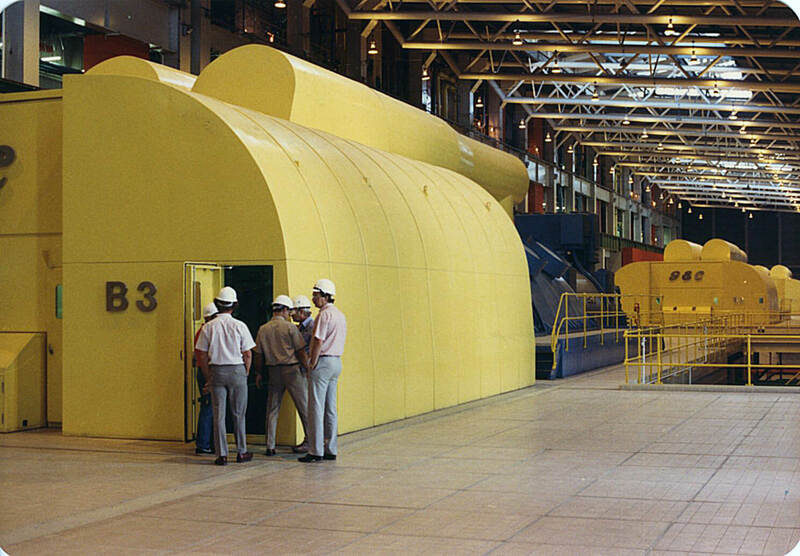 The first 350 MW unit reached the significant ‘steam-to-set’ deadline ahead of schedule on 27th February 1982. Coal firing commenced on 19th March and full commercial load was subsequently achieved. The build and commissioning period of less than four years from June 1978 to March 1982 was significantly less than the world average of between six to eight years from beginning of site work to commissioning the first generator at a new power station. 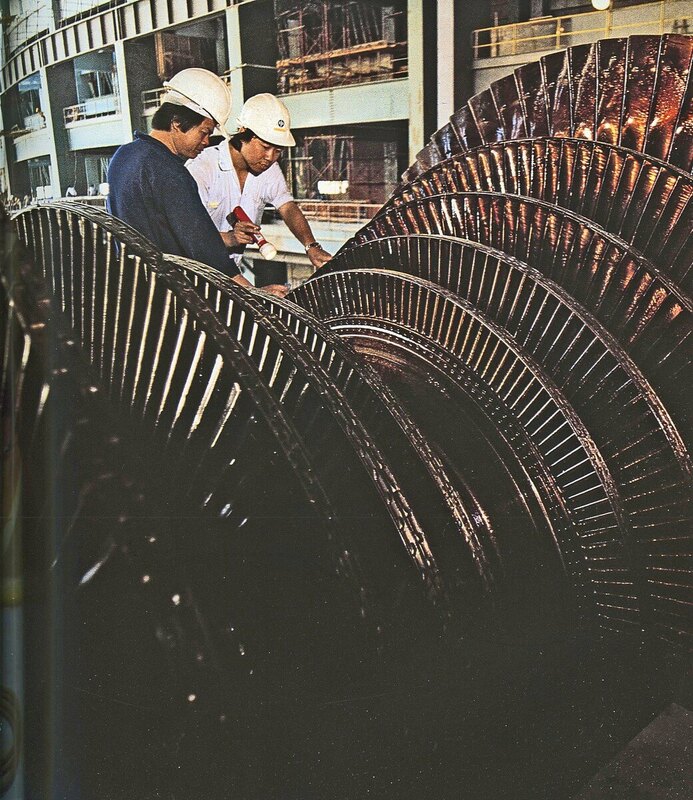 The remaining three 350 MW units were commissioned in each of the years between 1983 and 1985. The much larger ‘B’ Station generating units were commissioned between 1986 and 1989. Four gas-turbine driven electricity generators on the ‘A’ Station site had been commissioned in 1981. The conversion process on the main generating units, from the coal or fuel oil input to the electrical power output centers on a steam/water cycle with a number of peripheral support systems. The plant in use is the result of many years of development and has reached a high level of technical advancement and maturity. The main components are: The boilers, supported by coal and oil supply systems and ash disposal systems. Each boiler generates 1,000 tonnes/hour (‘A’ Station) and 2,000 tonnes/hour (‘B’ Station) of steam at 170 times atmospheric pressure and a temperature of 540°C (corresponding to dull red heat). Some 200 kilometres of tubing are required for each ‘A’ Station boiler and 300 kilometres for each ‘B’ Station boiler. No leakage of steam or water can be tolerated during operations. The steam turbines, electrical generators and feed water plant, are supported by cooling systems and water treatment systems. 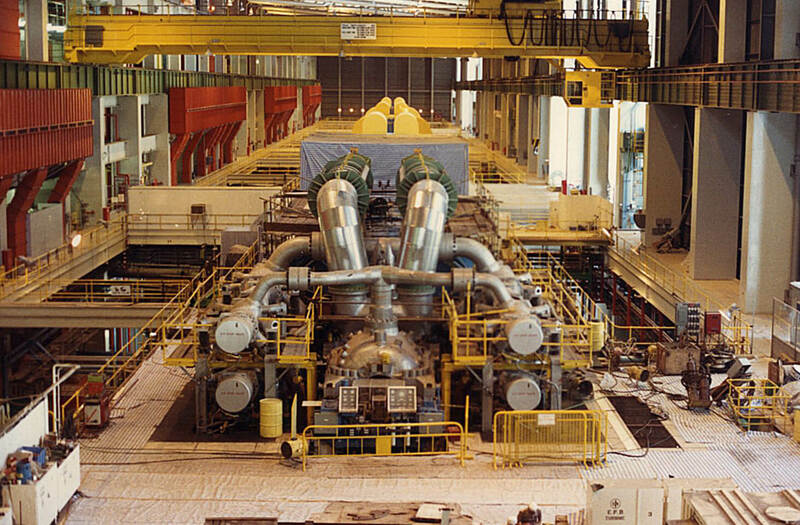 The turbine-generator shafts rotate at 3,000 r.p.m. (50 times a second) and carry blades up to 945 mm (about 36 inches in length). This means that the tips of the blades are moving at 2,000 km/hour and the steam flow past them is supersonic. Some 11 tonnes/second (‘A’ Station) and 21 tonnes/second (‘B’ Station) of seawater has to be pumped to each unit to condense the steam from the turbine exhausts back to water. The control and instrumentation systems give the operators the ability to control and monitor the plant largely from central control rooms. The training of operators is a vital aspect of any modern power plant and both ‘A’ and ‘B’ Stations are supported by simulators. 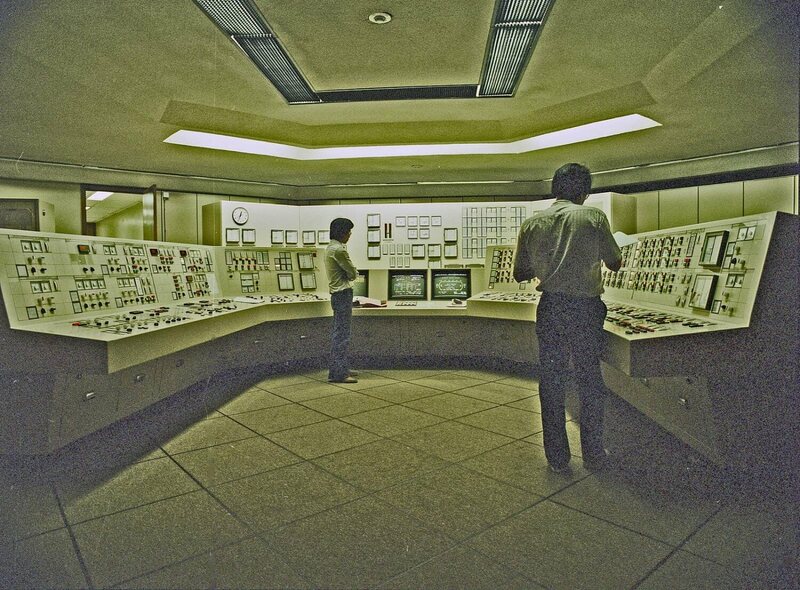 In each case, a control desk and panels identical to those in the control room are used, but driven by computers to simulate the behavior of the plant, under normal operating conditions and during equipment or system faults. Electricity generated from the steam driven generator sets is transmitted via the 400 kV substation at the site to the Extra High Voltage Transmission Network, while the gas turbines are connected into the system via the 132 kV substation at the site for local loads, and into the 400 kV substation via 132/400 kV transformers. The jetty constructed offshore of the site is capable of berthing two vessels of up to 120,000 DWT. 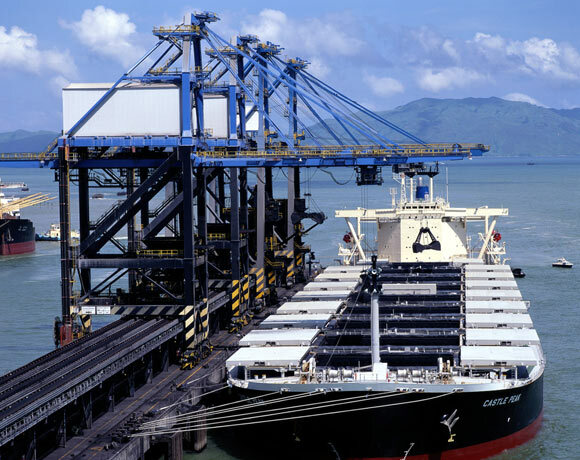 Coal is removed from the ships by grab-cranes and transported by a system of conveyors, either directly to the boiler’s bunkers or to the stockyard. When there are no ships at the jetty, coal is reclaimed from the stockyard and conveyed to the bunkers. Each conveyor can handle up to 3,000 tons of coal per hour. This article was first posted on 9th April 2015.